The basics of archery are simple to learn but challenging to master. Archery has something for people of all abilities and all levels of interest, from casual shooter to driven competitor, and everywhere in between. The Bay Area is rich in opportunities for archers. This brief guide is an overview of archery resources available in the Bay Area. 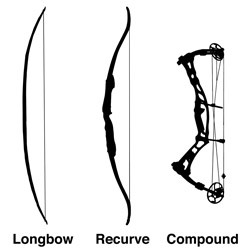 Three basic styles of bows are the most common: longbows, recurves and compounds, the latter being bows that use pulleys for extra mechanical advantage. The bow that will be right for you will depend on your personal preferences, physique and on what kind of archery you are interested in. People who like simplicity and tradition often lean towards longbows or recurves. People who seek the fastest possible bows, or wish to compete in certain kinds of target shooting often choose compound bows. An on-going, San Francisco-based archery instruction program which meets Saturdays at the Golden Gate Park archery range. Seasonal. Check the website for details on classes for students new to Golden Gate JOAD. Reservations required. Certified instructors. For Adults and Kids. Run by USA Archery Level 4 Coach, David Chan. Good equipment provided. Reasonable pricing. Private and group instruction by appointment at their San Francisco store’s indoor range. Certified instructors. Good equipment provided. There are many places in the Bay Area to learn basic archery. There are free introductory lessons at some outdoor ranges, classes by appointment at archery shops, programs at colleges and JOAD, a nationwide program for learning and practicing target archery for kids, and at many locations, adults. The most common way to learn to learn archery is to learn using a simple recurve bow having a light draw weight. With a light bow you can concentrate on learning rather than on strength. If you are interested in other kinds of bows, you can still learn the basics on a recurve and use that solid foundation for whatever kind of archery you pursue. So, first things first. Don’t rush out and buy a bow. If you already own one, that’s fine, but it helps to learn a little bit about bows before buying one and it is best to learn on a bow that is very easy to draw back, the kind provided by archery instruction programs for beginning instruction. In fact, one potential sign of a bad instruction program is if they don’t have any recurve bows of 30 pound draw weight or under. Beginning adults do well to start with bows with draw weights in the teens or twenties. If a program doesn’t have a light enough bow for you to draw back without shaking, find a program that does. Archery is a physical sport, so learning in person from a qualified instructor is the best approach. A good instructor will give you feedback and advice suited specifically to your abilities. Getting a good start is especially helpful in archery, since the instruction and feedback you receive will help you learn to recognize what proper form feels like so you can remember and practice that form on your own. The aphorism “Practice doesn’t make perfect; perfect practice makes perfect” holds true for archery. If you aren’t ready to take the plunge by signing up for instruction you can search online, buy a book, or visit one of the local archery clubs, where you can watch and ask questions. Many ranges have someone people tend to defer to for advice. Outdoor ranges tend to have more archers present on weekends, so you are more likely to find people to talk to then. You’ll often get good information, but archery is a diverse sport so you may get a different answer from everyone you ask. Several colleges have archery programs. Stanford University has an archery team, and private Olympic-level coaching available to the general public, a kids JOAD program: archery.stanford.edu . UC Berkeley has an archery team, the largest collegiate archery club in the nation and the club may be open to non-students: archery.berkeley.edu . And San Francisco City College has archery classes for credit. Many public outdoor ranges offer introductory instruction, including use of all needed archery equipment, on a limited basis. None of the public outdoor ranges rent archery equipment. For equipment rentals you will need to visit an archery shop or indoor range that offer’s equipment rental for use on site. When open, San Francisco Archery offers rentals for use at the nearby Golden Gate Park range. Consider taking lessons from a qualified program as outlined elsewhere in this guide. All Bay Area Field Archery trail range courses have some poison oak. Most trails are cleared, but think twice about hunting for lost arrows if they are in a tangle of poison oak. Another good reason to shoot close to the target. The Redwood Bowmen’s 14 target “Hill Range” in the Redwoods (targets 15-28) has no poison oak except for behind the last target. There are a number of archery clubs around the Bay Area. They host tournaments. Some tournaments are sanctioned official shoots, others are fun “club” shoot. 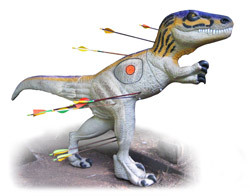 Many have novelty themes, such as Halloween-themed “Boo Shoots” or the “1,000,000 BC” shoot which features 3D dinosaur targets. This is a partial list of upcoming shoots. “Trad shoot” refers to “traditional” archery shoots that do not allow compound bows. Trad shoots are a lot of fun and great introduction to 3D archery events for newer archers and are a lot of fun. You don’t need to be an expert to shoot at these shoots. Look the shoots up on the web for more information. Archery doesn’t have to be complicated. It can be as simple as going to a practice range to casually shoot at targets; it can be social, as with club “fun shoots;” or it can be highly competitive. Field Archery courses feature short trail hikes with targets, spaced out along the trail. The Bay Area has lots of these field courses and most of them are open to the public and completely free to use. You can shoot these courses casually, hiking the trail and shooting at the targets from as close as you feel comfortable. Bay Area archery clubs with field archery courses have competitions throughout the year. Some are fun club shoots with simplified rules and others are fully sanctioned shoots that follow the more complex rules of the NFAA. Field Archery Safety Note: Always follow the trail forward, never walk back the way you came. There could be another group of archers behind you, further back along the trail. 3D is like field archery, but with life-sized foam animals instead of paper targets. The lifelike mannequins are often set in hunting-like conditions, in among trees and bushes. But, you don’t have to be into hunting to enjoy the adventure and fun of this pretend version of hunting, where no animals are hurt or killed. Some 3D shoots feature novelty targets and challenges. The San Francisco Archers 1,000,000 BC shoot features foam dinosaur targets. The “Traditional” Maya Stickbow shoot sometimes features shooting from canoes. Target archery is shooting at flat, circular targets from a fixed shooting line on a level field. Olympic archery is the best known form of target archery. Indoor target archery is also very popular since it can be practiced year round and in evenings. Distances are usually 20 yards or 18 meters. Some people really like the history of archery. There are various shoots that have a historical angle to them. Traditional shoots, where only primitive bows are used, can involve historical period camping as well as 3D trail shooting. The Society for Creative Anachronism also features medieval historical archery at some of its events, as do a number of other historical groups. 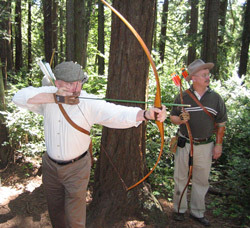 A number of local clubs and organizations have “traditional shoots” or “stickbow” shoots, where no compound bows or sights may be used. Traditional “3D” club shoots” are a great way to meet fellow archers. Trad shoots tend to be more low key** than events that have compound shooters. There are many good choices. If you are new to archery, consider talking lessons before buying a bow to get a feel for bows and what works for you. The best general purpose bow for beginners is the kind archery shops use for instruction: a wood handled bow with replaceable limbs–typically $70-150, new. Most adults should choose a bow at least 64” long and at a draw weight they can hold at full draw for at least 10 seconds without shaking, usually 30 pounds or under. Resist the temptation to buy a high draw weight bow to start off with. Replacement limbs of higher draw weight are available separately for some models and can be purchased later. If you want that option, check with your dealer first to make sure replacement limbs are available separately for the model of bow you buy. On many bows you should get your dealer to install an inexpensive “arrow rest,” a device the arrow will rest on the bow, and a nock locator on the bow string to help you place arrows at a consistent position on the bow string. You’ll also need accessories: an arm guard to protect your arm, a finger tab to protect your fingers from the bow string and a bow stringer, to aid in safely stringing the bow. And, of course, you’ll need arrows. The arrows need to be carefully selected to be the right length and flexibility for your bow’s draw weight and your draw length. Arrows should be longer than your draw length because your draw length will likely lengthen as you get better. Beginners should use arrows with feathers, not plastic vanes, since they are more forgiving. Good arrows will cost a little more than you expect, but they are one of the most important components. A good shop that knows about recurve bows can hep you select matching arrows. A shop that sells mostly compound bows may not do such a good job. Many people are interested in other kinds of bows, primitive stickbows, six-foot long English longbows, Howard Hill-style American flatbows, modern reflex/deflex longbows, fully accessorized Olympic style recurves. There are many variables in choosing such bows which makes them more of a challenge to pick out as a first bow. They can also be harder to learn to shoot, but there is a beauty and a romance to them that makes them very appealing. For more information on choosing bows, accessories and matching arrows refer to Anthony Camera’s Shooting the Stickbow. There are also many excellent compound bows, which are outside the scope of this guide. ● Junior Olympic Archery development (JOAD). A nationwide program of ongoing training and competition for kids. Many JOAD’s also offer training and achievement levels for adults. ● College Archery Program (CAP). CAP supports collegiate archery teams and competition. ● Coach training. The NAA has a multi-tiered system of formal training and certification for archery coaches, from basic to Olympic-level coaching. The Level 1 Coaching manual is also one of the best overviews of archery and how to shoot a bow. The National Field Archery Association is one of the largest archery organizations in the US. It sanctions Field Archery, 3D and indoor target archery competitions nationwide. Archery Australia’s Introduction to Archery is available on their archery instructor page. World Archery, the international governing body for Olympic Archery, has free archery manuals on-line. Both the Coaching Manual Level 1 and Coaching Manual Level 2 are available on their coaching page. These well written manuals have good information on target archery equipment and technique. The Level 2 manual has info on traditional longbow archery, as well. These manuals can be read by any archer, you don’t need to be a coach. Full line supplier. Largest dealer of Olympic and target archery equipment and supplies. Online-only retailer of Olympic target archery equipment and supplies. Slightly cheaper than Lancaster, but much smaller selection. Fewer target archery supplies. Probably the largest set of archery forums overall. Has a small but decent “Traditional” forum and a “FITA” forum for target archery. Forums for “traditional” (non-compound) archery. Finding the perfect archery book is really hard, especially if you are a recreational archer starting from scratch. These are some of the best I’ve come across for getting into recreational target archery, but each has its strengths and weaknesses. A comprehensive book about all aspects of “classic” target recurve archery, with and without sights. It also briefly covers modern longbow archery. The book doesn’t assume any prior knowledge of archery. It is self-published and a little rough around the edges in places, but also very complete, including specifics that other books leave out, such as what specific arrows to buy, how to use a bow sight, how to make strings, and much more. So much more, in fact, that it may even have more information than you want. However, if you are looking for a reference guide, more detail may be better. A compact but wide ranging overview of archery by expert coach Teresa Johnson. This is a contrast to Shooting the Stickbow in terms of size, yet it covers recurve, longbow and compound archery, as well as range layout, and even details about competition. However, it punts on a few of the basics, such as how to measure your draw length, sending you to an archery store rather than explaining how to do it. And it tries to teach the complicated USA Archery National Training System method of drawing and shooting – a system so nuanced even trained coaches have a hard time teaching it right. But otherwise Archery Fundamentals does a good job of clearly explaining archery equipment and methods in a relatively short book. A comprehensive and well illustrated high school and college-level textbook for recreational target archery using recurve and compound bows. This book covers everything from arrow selection to archery form. It is filled with details, photos and illustrations. It even gives specific arrow recommendations, making it useful for people who don’t have access to a local archery store or coach for advice who still want to take up archery. Most archery books skip over specific advice on arrows because it is a hard subject to summarize, but it’s also one of the first things you need to know to take up archery. Archery: Skills. Tactics. Techniques (Crowood Sports Guides) by Deborah Charles. This is a guide to shooting target recurve written by a British competitive archer. It will be more useful as a companion guide to someone shooting with a target archery club than a fully self-contained book. It glosses over how to measure draw length and how to select your first arrows. But it does give tuning and accessory advice and teaches the relatively straightforward method of drawing and shooting taught by Archery GB. It also features information and strategies for competition. A good introduction basic bow and arrow maintenance specifically for recurve and compound target archery. Useful, clear instructions in one compact volume. Some of the same kind of information can be found on-line and in other archery books, but this is a nice compilation. Check the link for a list of what is included in the book. Not available from Amazon. The classic book on Olympic Recurve archery by Olympic Champion and coach Rick McKinney. The book contains details on shooting technique and the mental game. This book doesn’t teach the latest techniques and fads and in spite of that, or more likely, because of that, it is still the number one recommendation of many top Olympic Recurve archers. The book has a section on equipment and tuning, but if you are just getting into archery you’ll probably want to also get a book with more detail on selecting equipment. Not available from Amazon.